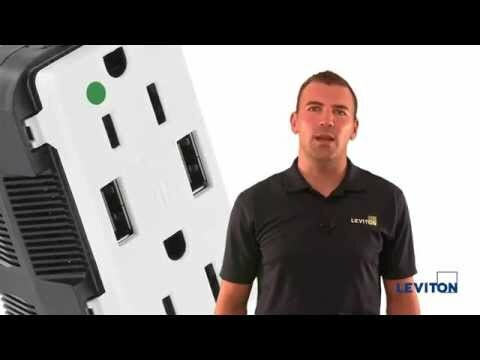 Leviton Straight blade decorator combination duplex receptacle/outlet and USB charger has PBT thermoplastic polyester resin construction for long-life durability. It features steel strap and brass contacts. It operates at a voltage rating of 125-Volts AC, current rating of 20-Amps and temperature rating of -10 to 40 deg C. It is compatible with USB 2.0 devices, decora wallplates and Decora Plus™ screwless wallplates. Its compact design fits in a standard wall box and can be multi-Ganged with other devices. It is suitable for use in kitchens, bedrooms, home offices, airport lounges, salons and spas, hotels, meeting rooms, office cubicles, college dormitories, cafes, coffee houses and restaurants. 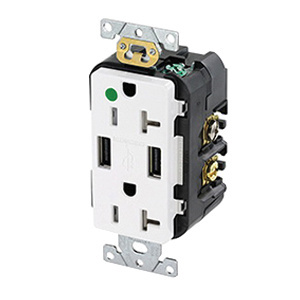 The tamper-resistant combination receptacle/outlet and USB charger meets cCSAus, UL 498 and 1310, CSA C22.2 Nos. 42 and 223, ANSI C-73, NEMA WD-1 & WD-6 standards.